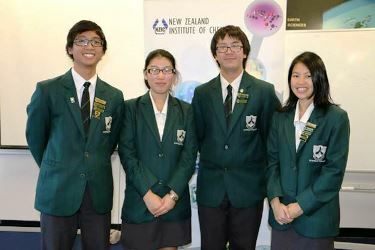 Now in its sixth year, this annual competition is a problem solving event for teams of three to four secondary students, organised by the Department of Engineering Science at University of Auckland. A question was posted online at 9 am and students had to compile a report and email it to the organisers by the 6pm deadline. 2014 question: If Mount Taranaki erupted, how much would it cost the aviation industry? 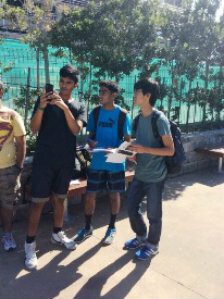 This year, we had five Year 12 and three Year 13 teams in this competition. The judges at the university are now going through hundreds of reports and the results of the competition will be released early next term. Above and below : Lynfield students attack the problem and construct a solution. 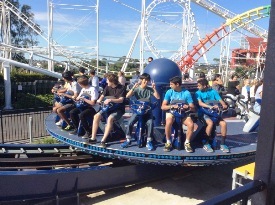 We have had another successful year at the Niwa Auckland City Science and Technology Fair. 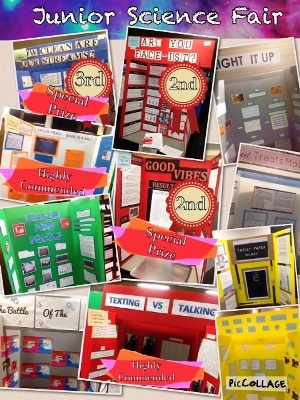 19 students displayed their work and were quizzed by teachers, scientists and industry professionals. Joshua Boasman, 9WL was awarded 2nd Place in the Physical World Category as well as a special prize with his project Good Vibrations. Karan Kalsi was awarded 2nd in the Living World Category for his project Are You Face-ist? Kitty Sun and Phoebe Liu placed 3rd in the Living World Category and also received a special prize for How Clean Are Our Streams. These students will be receiving their awards at the prize-giving ceremony on September 8th. Dylan Kay and Gus Barrowman, and Hannah Stephen and Angela Zhang also received commendations for their projects. The judges were impressed with the passion of our single senior entrant. Rowan Doyle received a commendation as well as a special prize for his project where he designed a personal hypothermia monitor. Congratulations to all those who worked so hard getting their projects together and we can't wait to see what our scientists come up with next year! Jessica, David, Boaz and Danielle report on a successful competition.. 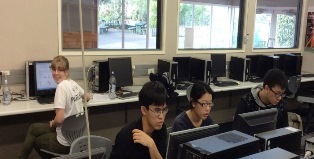 The University of Waikato organises the NZIC Analytical Chemistry competition every year and Lynfield has been participating in it for the past three years, with tremendous success. The event challenged 96 enthusiastic Year 13 students to spend a day in the university’s laboratories and apply their chemistry skills to accurately analyse, calculate and produce answers to set tasks, in order to derive an important chemical statistic. On being confronted with the laboratory set-up, we were overwhelmed. On it was equipment that was unfamiliar to us, and new methods were expected of us that we had rarely encountered. It was a challenging experience as we were now expected to apply our chemistry knowledge that we had learnt in class into a practical investigation in new and unfamiliar environment. This had brought a great, yet new and exciting challenge for us to take on. Through trial and error and a hard persistence, we presented our very best and were rewarded with a successful outcome. This year, we were placed 4th overall out of the 24 teams that had participated, and came home with a cash prize. All of our hard work and determination during those five hours in being precise and accurate with our measurements, yet scrambling to beat the clock in the final minutes to complete the task, had finally paid off. 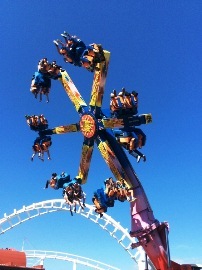 We had a great day, and enjoyed ourselves thoroughly, with a huge surprise in placing so highly in the competition. It was an exciting and nerve-racking experience to go up against all of the other teams, but we returned home proud of ourselves and the effort we had put in. 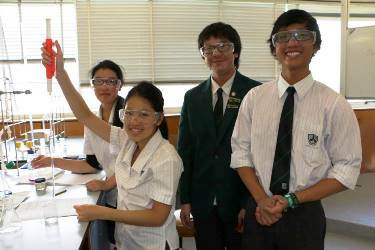 This is the second year that we have entered students in the regional rounds of the New Zealand Young Physicists’ tournament that took place at Westlake Girls High School, North Shore. The tournament started at 9 am and finished at 6 pm. We had a Year 12 team and a Year 13 team competing against mostly Year 13 teams from 17 Auckland schools (Each school could enter a maximum of 2 teams). 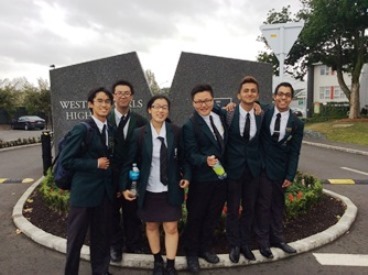 Our Year 12 team consisted of Pyong Kang Her (captain), Raynil Laxmidas and Pratik Chandra while Year 13 was represented by David Wu (captain), Jessica Yao and Steven Ling. The contest works this way : Prior to the tournament, competing teams, consisting of 3 students each, are given 7 complex problems to theoretically and experimentally research. 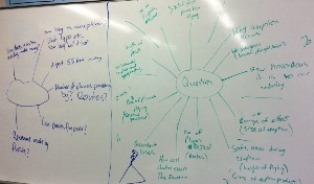 These questions are released in Term 4 of the previous year. At the competition the teams present and defend the validity of their solutions against teams in “Physics Fights”. Juries consisting of respected physicists and physics teachers rate their reports and the discussion that those reports generate. Each team is graded out of 10 points per judge, with 5 judges in total per fight. 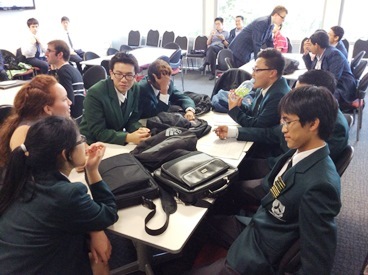 At the start of the tournament, our Year 12 students felt intimidated by the Year 13 students which may have led to them not doing do well in the first round of the “Physics fights”. However, once they overcame the initial fear and got used to the procedures involved, they gained valuable points in the remaining two fights. 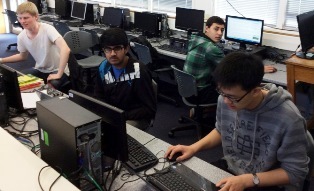 The Year 13 team continued to perform consistently in their “Physics fights”. Our Year 13 team finished 7th overall and our year 12 team finished 15th overall. Both the teams must be praised for the long hours they spent in preparation for the competition. The depth of the research, both theoretical and experimental, which they undertook in preparation for the problems will linger in their memories for a very long time. The teams look a little stressed just prior to the tournament (left image), but by the end were happy with their efforts (right image)! 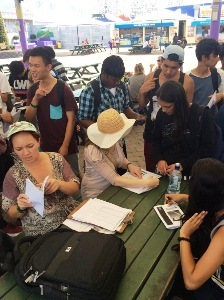 Mr Reddy and Ms. Tebay were the supervising teachers, who also acted as judges on the day. In addition Mr Black, Mr van Dyck, Mr Eyre and Mr Kumar also provided valuable feedback to both the teams prior to the competition. With this years’ experience behind them, they have already started the discussion for next year’s tournament. We are confident of having another good run next year. Each year the various Science courses include assessments that require authentic observation and collection of data. 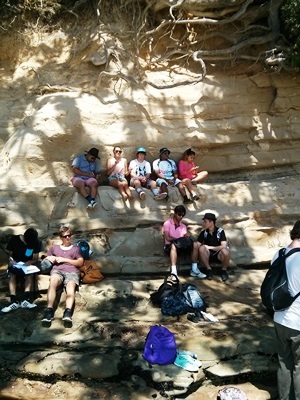 On the 27th February, the two 13SCI classes went on a Geology field trip to Milford and Takapuna. First up was Milford Beach to study the evidence of the Lake Pupuke eruption approximately 200,000 years ago. Students examined the igneous rocks and considered the dating methods that would be suitable for these types of rocks. 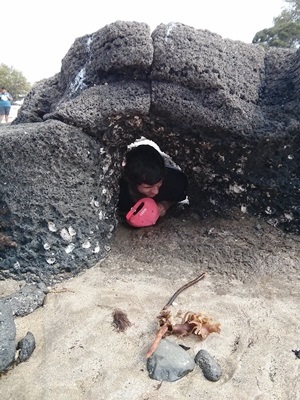 Then we trekked around the shoreline, over the beach and rocks, to Takapuna beach. Here we were able to examine the remains of a kauri forest that was growing in the area at the time of the eruption, and was incinerated by the lava flows. However, there are holes in the lava left by these trees, and that also helps with dating the eruptions. After lunch, we walked the length of Takapuna Beach to the sandstone cliffs at the south end. These cliffs were formed under the sea and were pushed up above sea level by the same geologic processes that formed the Southern Alps. Students examined the layers of rocks in the cliffs, and thought about how they would have been formed by the processes of weathering and erosion of the volcanoes that surround the Waitemata Basin. This information was then used in the writing of a report to earn credits for the “Dating Geological Events” Standard. 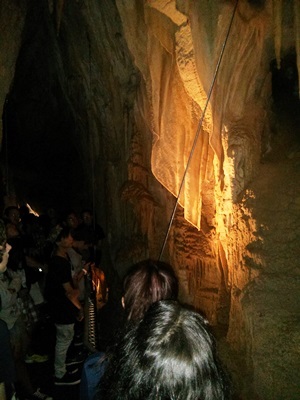 On the 27th March, the two 12SCI classes went to Waitomo Caves to investigate the geological processes that have formed this special area of our country. This involved meeting at school well before the normal time, as the bus left at 7am! First stop was the Glow Worm Caves, where we learned the cultural history of the area, and about the biology and life cycle of the glow worms, finishing off with a Gollum like boat ride on the river through the caves. Next we went to the Education Centre, where we learned about how the rocks that formed the area were formed under the sea, rose up above sea level, and then have been worn away and eroded to form the surface and underground features we had just experienced. 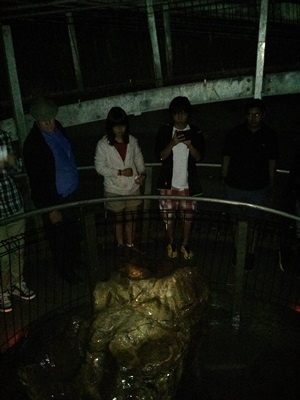 Finally, we went to the Ruakuri Cave, where we learned the science behind the different geological formations inside the caves, as well as being able to observe the things we had just learned about in the Education Centre, before the long bus trip back to Lynfield. This was all useful information for the report into the Geological Processes of a New Zealand Locality, and really helps to put the theory from the classroom into the real world. 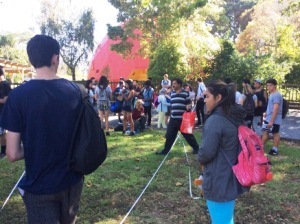 As part of the “Astronomy” standard, the two 13SCI classes went to the Stardome Observatory on the afternoon of Wednesday 2nd April. First was the planetarium, where students were shown the scale of the Universe, and how astronomers are using different tools to explore deep space. Next was a presentation about the sky at night, where we were shown what the sky was going to look like that night, where to find different constellations and planets, and some of the astronomical events that were coming up. After the show, students were able to explore the exhibits in the foyer, including how different types of telescope work, how much they would weight on different planets, and how the planets are different. Finally, was a session on how astronomers are looking for planets outside of our own solar system, using a variety of tools and what measurements they are each able to take. This information was invaluable for the assessment on “The Search for Exoplanets”.